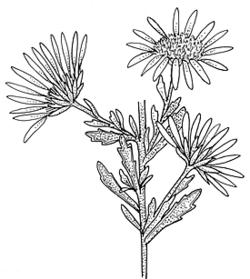 Olearia asterotricha (F.Muell.) F.Muell. ex Benth. Leaves alternate, scattered or crowded; lamina narrow-obovate, 6–27 mm long, 2–6 mm wide; apex acute or rounded, without a mucro; margins toothed or lobed or entire, revolute; surfaces discolorous, upper surface stellate-hairy and green, lower surface grey-stellate-hairy; venation indistinct; sessile or subsessile. Heads terminal, solitary or clustered, pedunculate or sessile, 21–37 mm diam. ; peduncle to 27 mm long. Ray florets 12–21, white. Disc florets 25–39, yellow. Achenes silky; pappus with 36–55 long bristles in 2-series and an outer row of short bristles. Distribution and occurrence: Grows in heath or dry sclerophyll forest in mountainous areas; chiefly from the Blue Mtns to the Moss Vale district. Varieties of this species are not recognized in this treatment. The varietal name O. asterotricha var. parvifolia Benth. has been applied (incorrectly) to specimens with leaves that are generally short and crowded.